How about that version 5.0 you’re talking about? That’s a good question. Let me explain. The major features I planned for version 5.0 were a Yosemite look and feel, a geocache images tab and a location picker (to choose a location for corrected coordinates, API searches and home locations. See screenshot). To implement these features I had to make major refactorings in the existing code. 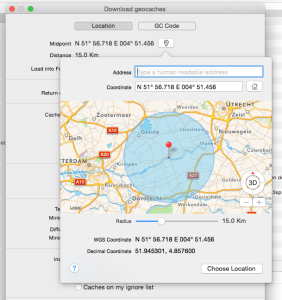 For example, for the location picker I needed the Apple Maps API, which is only available for Mavericks and higher (so that will be the minimum OS for version 5.0). That made it possible to replace a lot of legacy code by more modern APIs Apple is providing. Or another example; to add the photos, I need to do a database version migration. That provided the opportunity to make the data model more efficient (loading at startup with big databases! ), and prepare for new properties (user waypoints). The extra work involved was to create a migration process from the old to the new version, keeping your old data work in the new version. To make this version ship in a not too distant future, I will cut some of the planned features (probably photos too) for the first 5.x version. But a lot of groundwork has been done, so those extra features can be added soon after the first release. If you want to participate, please send a mail (using the contact tab on this site) and mention ‘Public beta’ in the subject field. But keep in mind that the first beta will not work with your current database, and the final version will probably not be able to use the data from the beta version too. The main goal of the beta is to gather feedback and find bugs, not (only) to make you enjoy ‘the latest greatest’. http://icaching.eu/wp-content/uploads/LogoWebSite200x100.jpg 0 0 mariusdereus http://icaching.eu/wp-content/uploads/LogoWebSite200x100.jpg mariusdereus2015-03-16 19:00:252015-03-14 10:52:56How about that version 5.0 you're talking about? While working on version 5.0 (which unfortunately takes more time than expected), I still want to do some maintenance on version 4.x. Once in a while I also like to add a few features in that version too. Recently some users asked if it were possible to add attribute names to the cache description when exporting them, so you could see them in the field. This seemed a pretty trivial programming excersise, so I added it in version 4.97. But unfortunately, this feature has caused a lot of crashes. This week version 4.97.2 (yes, I want to reserve 5.0 for the next big thing, so coming up with a proper versionnumber becomes more difficult every time) was released, fixing the glaring main issue in the export code. But after that update, some users still had issues. One was caused by a new attribute type (GeoTour) not yet supported in iCaching, and another for caches with an empty description. Both situations were not present in my test data, so everything went fine here. Today version 4.97.3 is submitted to Apple for review. That one should finally fix the export issues. My apologies for the inconvenience these issues have caused. And a big thank you for the users that helped me providing crash reports and example files. This helped me to solve this quickly. Within a few days we hope to release iCaching 4.90. We changed plans after the bumpy road to this version. Both 4.80 and 4.85 unfortunately had some serious bugs. Fixing these bugs took some time, therefore we decided to implement (the biggest part) of the new Yosemite style look, planned for version 5.0, into this version. Update November 13: Version 4.90 is released! 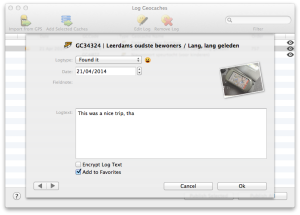 Since the start of iCaching more than four years ago, we’ve continuously been improving the application making it the most popular Mac Geocaching application. It takes a lot of effort to make and keep it state of the art. Until now every update has been available for all users, although some new features were not available for users of Snow Leopard. But Apple moves on, and so must we… Yosemite, the new OS X is around the corner. Apple choose to overhaul the UI and add a lot of new API for us. It is undoable to keep on developing (and testing!) for five iterations of OS X and three different UI appearances (Snow Leopard, Lion and now Yosemite). So for now we announce that the next big release (5.0) will be for Lion (OS X 10.7) and higher. We’re aware that a (very?) small part of our userbase will be disappointed, but for the mayor majority we really want to stay up to date. In the meantime there will be at least one bugfix update for all users. The left pane in iCaching with the Folders has colored icons in the current version. Since Lion, we should have used Apples so called template style images; grayscale images that are colored by the system (as in Finder) that are inverted when the row is selected. In Yosemite we must use these template style images to support the nice vibrant (translucent) style, but it is (almost) impossible to use this style and stay compatible with Snow Leopard. 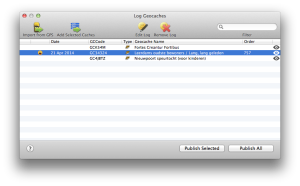 – The ‘Get more logs’ button on the Log tab doesn’t work. – Uploading photos with logs doesn’t always work correctly. In the meantime we’re also working on a big new 5.0 release. There are two main themes for this release: bring the UI (including the App Icon!) in line with the upcoming new OS X version (Yosemite) and secondly; add Geocache Photos to the mix. The release of this version will take a little time, but we hope to be ready when Apple is ready to launch Yosemite. http://icaching.eu/wp-content/uploads/LogoWebSite200x100.jpg 0 0 mariusdereus http://icaching.eu/wp-content/uploads/LogoWebSite200x100.jpg mariusdereus2014-09-08 19:08:032014-09-08 19:57:21What is coming up? Last week version 4.6 was released. This version is a pretty minor release after the big feature 4.5 version. Albeit this new version adds some handy interface elements. We added Folder and Geocache menus to the main menu for commonly used functionality. We also added the ability to collapse parts of the main window, like the listpane to the left and the tabs pane at the bottom. Perfect for users with a smaller screen. Tip: take a look at the keyboard shortcuts! There are also multiple bugs solved. Most important ones: timezone issues with logging of caches and crashes on import (some users experienced this, but unfortunately not reproducable on our development machines). Today we send version 4.65 to Apple for review, to solve some more bugs. In version 4.6 we introduced an issue that the Map jumps to the home location every time the Map is activated. There was also an issue with photo’s sticking to multiple logs. Both will be solved. From now on you can log your finds (or didn’t finds) directly from iCaching. Even including photos. This was one of the most asked features. You can import the fieldnotes from your GPS, or select caches from your database to log them. 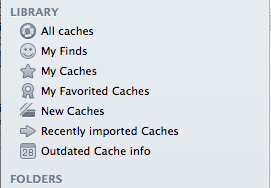 iCaching keeps track of your number of finds, you can reorder the logs by drag and drop.